As the East Coast of the United States basked in unseasonably warm weather in early January, some shoots of hope sprouted from the frozen earth of the Doha round of trade talks (see our cover story, page 16). After only a gentle nudge from European negotiators, US president George W. Bush threw his weight behind a renewed push from Europe to get the stalled talks moving again. At the same time, officials on both sides of the Atlantic expressed cautious optimism that the talks, put on ice last summer by World Trade Organization director-general Pascal Lamy, might yet recommence and produce some positive results. Supporters of the process can only hope that the talks’ glacial progress will yield some kind of agreement—and soon. While the WTO struggles to find a way to move forward, trading partners around the world are setting up smaller bilateral and regional agreements that could eventually render any global deal practically meaningless. China, for example, has just inked a deal with the Philippines that will boost trade between the two nations, and as we find out in our cover story, there are plenty of other pacts in the pipeline that will muddy the waters for the WTO negotiators. Part of the impetus behind the scramble to establish trade agreements comes from the growth in the global economy and the surge in global trade. According to US-based credit insurer Euler Hermes ACI, the stage is set for continued growth in global trade—albeit at perhaps a slightly slower rate than last year’s blistering 9%. And the International Monetary Fund predicts that global economic growth will not slow as much as many economists have suggested and expects it to turn in a robust 5% for 2007. 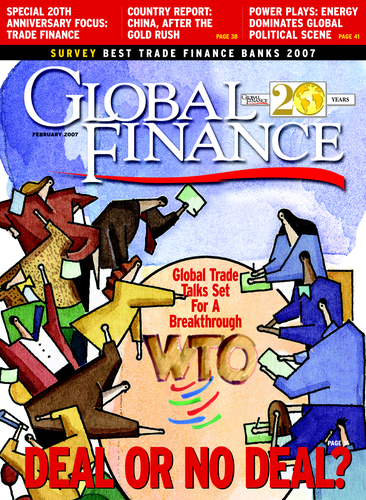 The IMF is also playing down the significance of the economic imbalances that so preoccupied analysts and economists throughout 2006, characterizing them as a sign of the success of world trade rather than a symptom of imminent failure. The proliferation of smaller trade agreements adds a greater note of urgency to the efforts to get the Doha Round up and running again, as the world’s economy as a whole is more likely to benefit from one major trade pact than a slew of local deals. The need for a decisive move forward is unquestionable. The chances of it happening, however, are pitifully slim.